Sprinkle a clean cutting board with pink sugar. Unroll one pie crust on top of the pink sugar. With a basting brush, spread a small amount of melted butter over the top of the pie crust. Sprinkle with yellow sugar. Repeat with another pie crust, butter, green sugar. And repeat again with pie crust, butter, blue sugar. Use a rolling pin to gently roll the pie crusts until 1/2 thick. Cut the rounded corners of the pie crust off to form a large rectangle of dough. Mark a small indentation in the center of the dough, roll one side of the dough tightly toward the center, roll the second side of the dough tightly toward the center again. With a sharp knife, slice the rolled dough into 1/4 slices. Place these slices on a parchment-lined baking sheet. Bake for 9-12 minutes, or until the edges of the angel wings turn a light, golden brown. Remove and allow to cool just slightly, transfer to a cooling rack. If you've never made Polish Angel Wings cookies before, here's your step-by-step how-to! Sometimes traditional is sweet. But at Tablespoon, traditional is just a recipe begging for a twist! Here we offer our super-simple take on classic Polish Angel Wings cookies, a favorite treat for the holidays. No mixing needed! 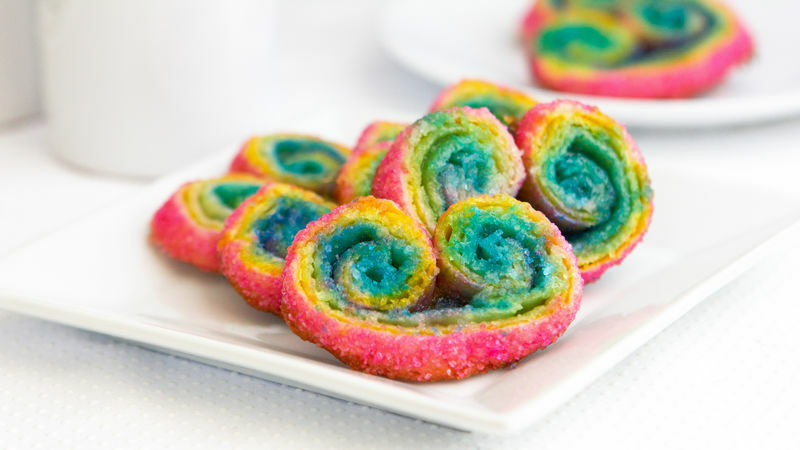 Just start with Pillsbury pie crust and you'll have two dozen rainbow-pretty Chrusciki cookies in no time at all! Start with two boxes of Pillsbury pie crust. Sprinkle some pink sugar onto a clean cutting board. Unroll the pie crust on top of the sugar. Use a basting brush to spread a thin amount butter on top of the dough. Sprinkle with yellow sugar. Top with pie crust, another schmear of melted butter, then green sugar. Finalize it all with pie crust, another schmear of melted butter, and blue sugar. Use a rolling pin to roll the dough to about 1/2" thickness. Mark a small indentation in the center of the dough, then roll one side of the dough tightly, until the center mark. Roll up the other side to create your colorful "angel wings". Use a sharp knife to slice the angel wings into 1/4" thick pieces. Place on a parchment-lined baking sheet and bake for 9-12 minutes, or just until the edges become a light golden brown. Remove and cool slightly before transferring to a cooling rack. Serve your angel wings with coffee, hot cocoa, or a steaming mug of cider. And enjoy!